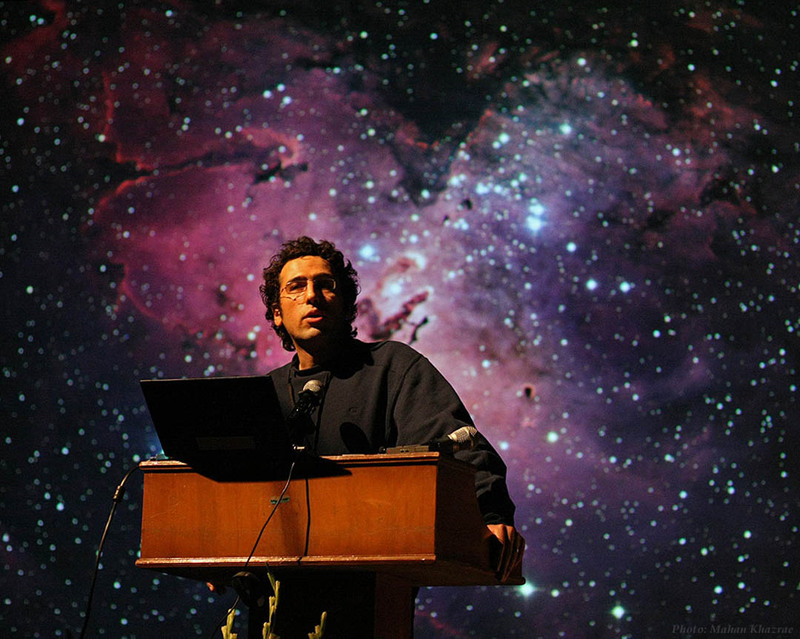 Babak Tafreshi, an Iranian-born artist and science journalist, leads an astrophotography workshop in the Maine wilderness and gives a talk related to the Bates exhibition “Starstruck” during October. Science journalist Babak Tafreshi leads a wilderness photography workshop and offers a lecture related to the Bates College Museum of Art exhibition Starstruck: The Fine Art of Astrophotography during October. Tafreshi leads the workshop in Maine’s Moosehead Lake Region Oct. 17-20 and offers an Oct. 22 lecture at Bates. He is the founder of The World at Night, promoting world peace and environmental stewardship through an exhibition of photographs of the night sky over prominent earthbound landmarks. Learn more about the astrophotography workshop. The workshop takes place at West Branch Pond Camps, Maine’s oldest continuously operating sporting camp, located near the town of Kokadjo. Participants must provide their own transportation, but carpooling is encouraged and the museum will coordinate it. Titled The World at Night and exploring the importance of the night sky, Tafreshi’s lecture takes place two days after the workshop at 6 p.m. Monday, Oct. 22, in Room 104 of the Olin Arts Center, 75 Russell St. A reception in the art museum, also in the arts center, follows. Weather permitting, a star-viewing party guided by local amateur astronomy clubs will follow the reception, offering visitors a firsthand look at celestial wonders. The public is welcome to all three of the evening’s events free of charge. The Bates Museum of Art is open free to the public from 10 a.m. to 5 p.m. Mondays through Saturdays, and Wednesday evenings September through May until 9. For directions and more information about events, please visit the art museum website. “The eternally peaceful night sky looks the same above symbols of all nations and regions, attesting to the truly unified nature of Earth as a planet rather than an amalgam of human-designated territories,” remarks Tafreshi. He is one of 37 artists from around the world featured in “Starstruck,” one of the first exhibitions to treat astrophotography as an art form. As a science journalist, Tafreshi has contributed to many television and radio programs on astronomy and has interviewed renowned astronomers and space scientists. He was editor of Iran’s astronomy magazine and is a contributing editor of Sky & Telescope Magazine. Tafreshi’s global contribution to night sky photography garnered him science’s most prestigious imaging honor, the Lennart Nilsson Award, in 2009. That same year, the United Nations Educational, Scientific and Cultural Organization (UNESCO) and the International Astronomical Union designated TWAN as a Special Project of the International Year of Astronomy. “Babak is an ideal person to draw together the threads of all the disciplines across the liberal arts,” says Anthony Shostak, the museum’s curator of education and the organizer of Starstruck. Starstruck is perfectly suited for teachers in all levels of education to engage with art related to a variety of subjects including astronomy and physical science, history, geography, literature, religion and math. Group tours are welcome by appointment: please contact 207-786-8302.